It’s unlikely the Christmas tree industry is making a major impact on raw material purchases across the world, despite the fortnight-long purge of Christmas tree farms. 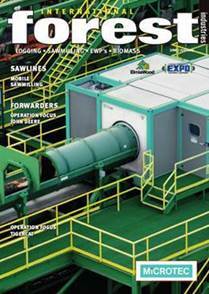 But that doesn’t mean the festive period will be a slow one for harvesters and wood processors. 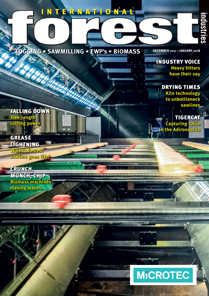 The mood from the industry’s heavy hitters as gauged by our Industry Voice feature in this edition – we spoke to the world’s largest suppliers of forestry kit who are strongly leveraged to the sector – was overwhelmingly positive. And this is reflective of the conversations we’re having with companies of all sizes. 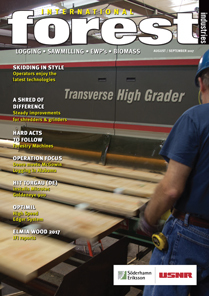 The health of the forestry sector is fundamentally pegged to the health of the world economy. We build homes, factories, offices and other infrastructure when we have money and saves our pennies when times are tough. Coming out of the global economic crisis in 2008, the conversations we were having reflected incremental improvements off a low base. Margins were tight and spending on new technology as a means to increase those margins was under intense scrutiny on the basis a poor investment could spell the end of the business. That exceptionally tricky patch was expected to last but a few years, however, an anaemic US economy and political problems that undermined growth in Europe meant this unpleasant window was elongated. Following two years of negative GDP growth in 2008 and 2009, China single-handedly pulled economic progress back to over 4% in 2010 before a prolonged period of growth around the 2.5% mark. The International Monetary Fund (IMF) over this period consistently downgraded its forecasts – essentially downgrading its downgraded numbers. For the first time in a long time, this year feels different. 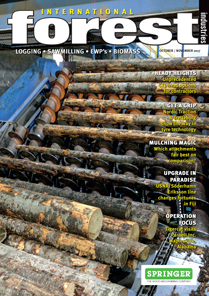 Progress for the forestry industry feels more significant led by a world economy that has decided it is sick of treading water. While the final numbers obviously aren’t in, the IMF is expecting growth for 2017 of 3.5%, which is an upward revision. Though still below pre-crisis levels, growth for 2018 is expected to be higher again at 3.6%. The optimism is mainly around the economies of Europe and the largest in Asia, namely Japan and China, while the US has been more recently sluggish. This is, however, a case of other globally significant economies taking their share of the strain following something of a solo effort from the world’s largest economy in the past couple of years. The US, while not immediately expected to perform strongly, is not in bad health. More importantly for our industry is how these overriding numbers are translating through to equipment sales. And, on this, I’m pleased to say the anecdotal evidence is strong, with most companies we speak to filling order books, firming up market positions and preparing to move into new markets globally. As most of us look to take at least a few days off over Christmas – the International Forest Industries office will thankfully close its doors from December 22 to January 2 – it will be comforting to feel like the industry is recharging its batteries ahead of an opportunity to fatten margins and take on new challenges associated with business growth, rather than simply taking a breather from the ongoing fight for survival. From all of us here at IFI, we wish you and your families a safe and happy festive period!